Young Pro Challenge rookie Kyle Benjamin was the star of the show during the Pro Challenge North Region’s season opener Saturday afternoon at Orange County Speedway in Rougemont, NC, but it was Ryan Glenski who stole the victory when it counted. Benjamin earned the pole over defending series Rookie of the Year Kyle Wilson and 2008’s Most Popular Driver, Meghan Dillner in qualifying. He then checked out from the field from the drop of the green flag. Dillner made the first advances on Benjamin in the first 15 laps in her number-51 until contact between Glenski and Dillner put the number-34 on a quest to catch Benjamin. Benjamin’s number-71 appeared to be on cruise control, until a caution flag with just two laps remaining in the 50-lap event put a serious damper on his plan for a season-opening victory. During the green-white-checker restart, Glenski made a power move on the outside groove to earn his second-career Pro Challenge win in as many series starts. Glenski’s rear bumper-cover flew off mid-race after another competitor tagged him from behind when Glenski’s machine failed to come up to speed on a restart. Undeterred, Glenski kept pushing his car to its limits as he chased down Benjamin – a feat made possible with the final caution. Glenski made his first-ever Pro Challenge Series start in a non-points event at OCS last June for the series’ rookies. 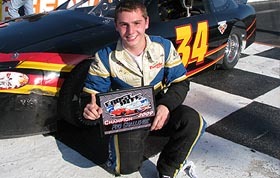 Glenski, a former Bandolero Champion, strapped into a Pro Challenge machine for the first time and scored the victory. That track time in a Pro Challenge car at Orange County helped set the stage for his winning effort on Saturday. Glenski was followed to the line by Benjamin, but in post-race technical inspection, Benjamin’s #17 was disqualified for shock and sway-bar arm rules infractions. That handed the second-place finish to Stephen Bergh, Jr. Chris Brown followed in third with his best-career Pro Challenge finish, while Kyle Wilson and Trevor Edwards rounded out the top-five. The Pro Challenge North Region will be back in action on Saturday, March 14th with a 50-lap feature at Hickory Motor Speedway (NC). The event will be an undercard event for the UARA-Stars Late Model Stock Car tour’s season-opener. Ryan Glenski took the Curt Andrews-owned #34 to victory lane at Orange County. 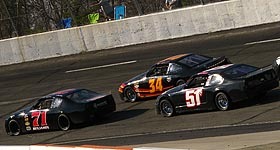 Benjamin (#71), Glenski (#34) and Dillner (#51) put on a show at the front of the field mid-race.